I’m a BIG fan of Instagram. I find it a huge source of inspiration for my modeling and there are some really great folks there happy to share and suggest ideas. 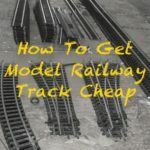 Here’s my list of the best Insta-model train accounts. Follow them now and give your modeling motivation a kick up the proverbial. #modelrailway #ogauge #scalemodel #mainlinemicros #nevardmedia #modelrailmagazine Chris Nevard shot of Severn Tunnel East. 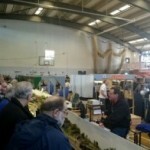 Longtime followers of Model Railway Engineer will know Stephen Fay. He’s written a couple of posts here previously (make your own grass, make your own engine shed ash). 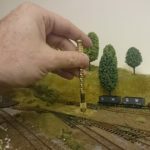 He posts regularly on Instagram with eye-popping and simply stunning O gauge model work. 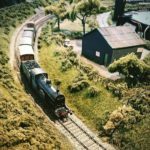 If you like a mix of steam and modern rolling stock, @modelrailwayoo is one to follow. His OO gauge loft layout is a work in progress but it’s a joy to watch it develop and his ideas. 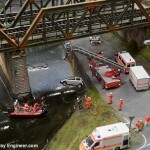 Very similar to the OO photos (above), modelrailroadh0, shows photos the beautiful work but in HO. Although the descriptions are in German, fitting the German railways modeled, I still look forward to seeing the photos for their realism and beauty. Another modeler who has featured on the blog before, Danny Young aka scratch_built_models. 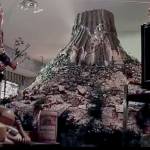 He doesn’t do a lot of railway modeling per se, instead, he’s an expert building modeler. His work is astonishing and always leaves me wanting my own dilapidated shop fronts while also giving me numerous ideas for improving my own models. When it comes to glorious landscapes, there are few to rival Martin Tärnrot and his Instagram page marklinofsweden. Just visit his page and look in awe at this stunning modeling. 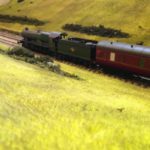 If you ever buy a standard model train and place it on your layout and think it looks a bit, well, erm, cheap then the remodeled locomotives of Stephen Hatt – sudrianhistories – are for you. 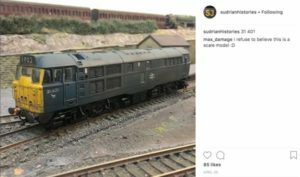 On his Instagram page, Stephen reworks old models into stunningly realistic rolling stock. 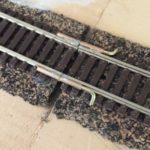 And of course, there’s my own Instagram account: model railway engineer. 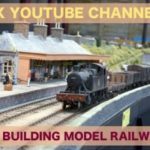 Here I post photos and occasionally short videos of what I’m up to, how to do things and railways I’ve visited.